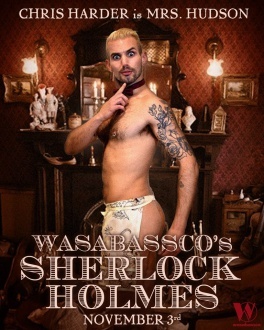 Sherlock Holmes and the Case of "The Scarlet Buttcheek" is an American burlesque striptease-play written and directed by Nasty Canasta, performed by Wassabassco at The Bell House (New York, USA) on 3 november 2017, starring Nasty Canasta as Sherlock Holmes and Sapphire Jones as Dr. Watson. 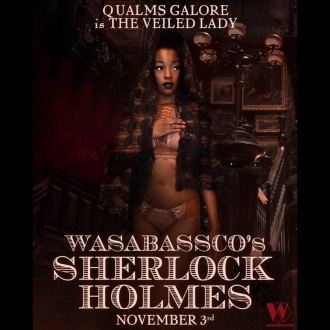 Travel back to Victorian London and join Holmes and Watson at 44DD Baker Street. Can the celebrated detectives uncover the clues (and the cast) in this, their most difficult and naked case yet? 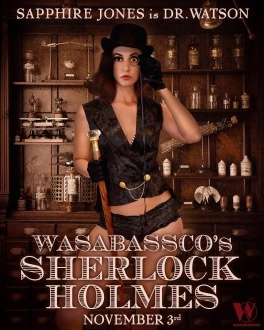 Or will the fiendish Moriarty succeed in her tassel-twirling plot to strip the monarchy of its crown - and everything else? Is the Empire safe from this scandal in Brooklyn? Only one this is certain: when you have eliminated the clothing, whatever remains, however improbable, must be naked. All names are stage names. Others actors : Hazel Honeysuckle, Jenny C'est Quoi, Penny Wren, Puss-N-Boots, Sydni Deveraux, Amuse Bouche, Rex Halligan, James And The Giant Pasty. This page was last edited on 14 December 2017, at 22:30.